SplintR® Ligase ligates adjacent, single-stranded DNA splinted by a complementary RNA strand. SplintR Ligase, also known as PBCV-1 DNA Ligase or Chlorella virus DNA Ligase, efficiently catalyzes the ligation of adjacent, single-stranded DNA splinted by a complementary RNA strand. This previously unreported activity may enable novel approaches for characterization of miRNAs and mRNAs, including SNPs. SplintR is ideally suited for many target enrichment workflows with applications in next-generation sequencing and molecular diagnostics. 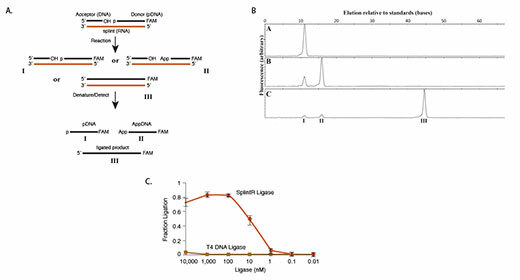 The robust activity of the enzyme and its affinity for RNA-splinted DNA substrates (apparent Km = 1 nM) enable sub-nanomolar detection of unique RNA species within a complex mixture, making SplintR ligase a superior choice for demanding RNA detection technologies. The enzyme is active over a broad range of ATP concentrations (10 µM – 1 mM) and pH (6.5–9). Optimal activity is observed using Mg2+ > 5 mM, and a pH between 7.5 and 8.0. The activity is enhanced at higher temperatures (up to 37°C), and by supplementation with 5 mM Mn2+. The reaction is inhibited by salt concentrations in excess of 100 mM. The enzyme tolerates all base pair combinations at the ligation junction, but is partially inhibited by dC/G and dG/C base pairs at the donor (phosphorylated) side ligation junction, particularly when the +2 base was also a C/G base pair. (A) Outline of the ligation assay: a 5´-phosphorylated, 3´-FAM labeled DNA “donor” oligonucleotide and an unmodified DNA “acceptor” oligonucleotide are annealed to a complementary RNA splint. This substrate is reacted with a ligase to form a mixture of unreacted starting material (I), adenylylated DNA (II), and ligated product (III). These products are denatured, separated by capillary electrophoresis and detected by fluorescence. (B) Ligation of the RNA-splinted substrate in SplintR Ligase Reaction Buffer for 15 minutes at 25°C with (a) no enzyme, (b) 1 μM T4 DNA Ligase and (c) 100 nM SplintR Ligase. Indicated peaks correspond to starting pDNA (I), AppDNA (II) and ligated product (III) as determined by co-elution with synthetically prepared standards. (C) The fraction of ligated product catalyzed by either SplintR Ligase or T4 DNA Ligase was analyzed by performing sets of ligations with both ligases at concentrations between 10 pM and 10 μM for 15 minutes at 25°C. 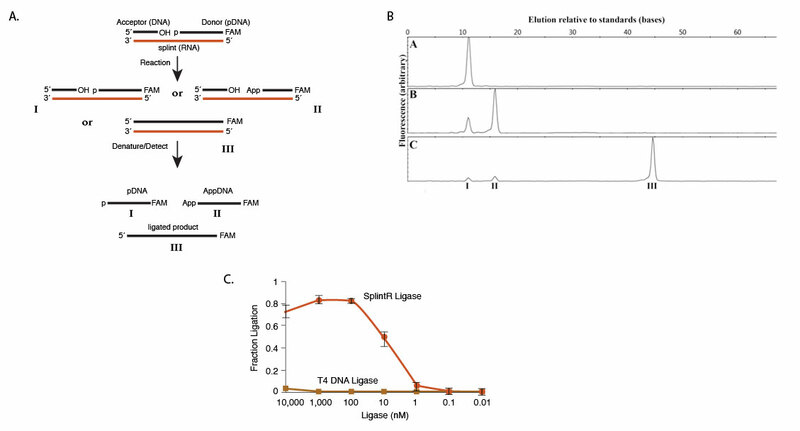 SplintR Ligase is clearly much more efficient at ligation of RNA splinted DNA than T4 DNA Ligase. An E. coli strain that carries a recombinant gene encoding PBCV-1 DNA Ligase. One unit is defined as the amount of enzyme needed to ligate (to 50% completion) 2 picomoles of a tripartite FAM-labeled DNA:RNA hybrid substrate in a 20 μl reaction at 25°C in 15 minutes in 1X SplintR Ligase Reaction Buffer. SplintR Ligase is inhibited by monovalent cations. We strongly recommend ensuring these common reactants (NaCl, KCl) are kept to below 50 mM in the reaction. The enzyme is supplied in a storage buffer containing 300 mM NaCl, for storage stability. A minimum 6-fold dilution of the enzyme by addition to the reaction is recommended, with the optimal dilution being ≥ 10-fold. If dilution of enzyme for storage is needed, we recommend using Diluent A (NEB #B8001). Reactions with SplintR should be performed between 16–37°C. We recommend initial testing be performed at 25°C. The enzyme is supplied as a 10.5 μM solution. We suggest maintaining the enzyme below 1 μM in the reaction with a suggested range of 100 nM to 1 μM. For many applications, starting with a 2-fold excess of enzyme over ligatable ends is ideal. For example, in the experiment described in the accompanying figure a substrate concentration of 100 nM was found to be ideal. In that workflow, 250 nM enzyme gave complete ligation in 15 minutes on all sequences tested. If the reaction is not proceeding as efficiently as desired, we strongly recommend extending the incubation time rather than increasing the concentration of enzyme in the reaction beyond 1 μM. An alternative option for recalcitrant substrates is to use a low concentration of ATP. A low ATP buffer can give higher yields of ligation product for substrates that have low ligation efficiencies in the standard SplintR Ligase Reaction Buffer, such as substrates with runs of G:C base pairs at the ligation junction. We suggest 1X T4 RNA Ligase Reaction Buffer (NEB #B0216) supplemented with ATP (NEB #P0756) to a final concentration of 10 μM. We recommend an RNA splint of at least 20 complementary bases. We have found 10 bp of dsDNA/RNA on either side of the junction to be sufficient for all substrates tested. The splint does not have to be centered on the ligation junction, however, with as few as four bases on one side of the junction giving complete ligation for a splint with 20 bases of total complementarity, depending on substrate sequence. If regions of overlap <10 bp are desired, some testing will be required to determine the minimum length of the ds region for your specific sequence. Increasing reaction temperature has been shown to improve activity and specificity of SplintR DNA Ligase. Incubation at 37°C gives improved results in detection of microRNA . Addition of ET SSB (NEB #M2401) has also been shown to increase activity and reduce off-target ligation when ligating DNA probes to RNA using SplintR DNA Ligase . Lohman, G. et al. (2014). Nucl. Acids Res. 42, 1831-1844. Jingmin, J. et al. (2016). Nucl. Acids Res. 44, e116. Eugene, J., Wee, H. and Trau, M. (2016). ACS Sens. 1, 670-675. What type of ends does SplintR Ligase join? I would like to use SplintR Ligase in a workflow, but not use the provided reaction buffer. Can you tell me what reaction buffer components are needed? Can you tell me what inhibits SplintR Ligase? SplintR Ligase seems very concentrated at 25 units per microliter. How do I know how much to add to my reaction? How can I maximize ligation fidelity when using SplintR DNA Ligase? Can SplintR® DNA Ligase be used for ligation-based methods of microRNA detection? SPLINTR® is a trademark of New England Biolabs, Inc.